If you think you don’t have a use for a toaster oven, then chances are you just aren’t familiar with all today’s modern toaster oven can do for your kitchen and your cooking routine. To begin with, toaster ovens are the perfect solutions for foodies who have limited kitchen space available for multiple appliances, as they can handle many of the responsibilities associated with standard ovens. However, they’re an equally advantageous addition for kitchens of any size because of their high degree of flexibility. The outdated and limited toaster ovens that you probably associate with your grandmother are long gone. A newer model toaster convection oven is capable of a lot you never would have thought possible before and the Breville BOV800XL smart toaster oven has even more to offer than is typical. Let’s take a closer look at what the Breville brings to the table. One of the most common complaints people had about early toaster ovens was the way they weren’t able to regulate heat very well. You either wound up with an oven that didn’t have the heat power necessary to cook more complex foods or you ended up with food that was partially burnt and partially under cooked. However, the Breville BOV800XL toaster oven strikes a perfect balance between the two by implementing some of the most innovative new features under the sun today. To begin with, it features five premium quartz heating elements combined with Breville’s innovative Element IQ convection fan technology. Element IQ technology helps channel the power exactly where you need it for evenly cooked food each and every time. Quartz heating elements ensure optimal heat conduction and a long appliance life you can count on. A full 1800 watts’ worth of power and a reliable convection fan that distributes heat evenly ensures that it has the power to perfectly cook all of your favorite foods to absolute perfection. 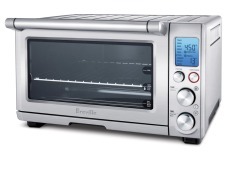 The Breville BOV800XL toaster oven also features nine different pre-set cooking functions to make quickly and perfectly cooking your favorite foods a snap. Use the toast and bagel settings to prepare your favorite breakfast treats with ease. Bake cookies and even pizza – two foods that are notoriously difficult to cook properly in a toaster oven. Even reheating, broiling, and keeping prepared foods warm is possible with this particular toaster oven in your corner. Because of the Breville’s smart toaster oven technology, heat is handled in such a way that it delivers the perfect results each and every time. No more guesswork! No more need to worry about your toaster oven not delivering the same results you would normally expect from a standard oven — just delicious food that’s cooked properly each and every time! It’s more energy efficient than your standard oven as well, so you can even save a bit on your electric bill. It’s one thing to invest in a best convection oven that offers you the very best in modern cooking technology… but what do you do if you like your pizza, your toast, or your cookies cooked a specific way? You can fine-tune the results you get from Breville’s Element IQ technology with the easy-to-use adjustment knob as well. This makes it a simple process to get the personalized results you’re looking for even when taking advantage of the many ways this product makes the cooking process easy on you. Your smart oven is even capable of storing and recalling your preferences for implementation next time. 0XL smart toaster oven menu either. A premium grade backlit LCD screen that simply and effortlessly guides you through the full menu of options makes it pretty foolproof. You can see at a glance important data such as the current function in process, any adjustments that have been made to settings, and the current temperature of your oven to help you maintain control over every aspect of the cooking process. While a good toaster oven is primarily about easy, effective cooking and simplicity of use, there’s certainly something to be said for extras that help seal the deal. Check out some of the following features that help set the Breville BOV800XL apart from the rest of the competition. The Breville BOV800XL smart toaster oven doesn’t need to be preheated for lengthy periods of time the way a standard oven does. Super-quick hat-up times ensure that your oven is ready to go in record time – perfect for on-the-fly baking projects! Three different rack positions help you position food optimally for just the right results each and every time. Worried about safe removal of your cooked food? Don’t be! The Breville BOV800XL features a wire rack that ejects halfway out of the oven itself to allow you easy removal of finished items without risk of injury. Embossed, ribbed top surface serves double duty as a warming tray to help keep finished foods ready to go until you’re ready. Beautiful modern design helps this oven fit easily into any kitchen décor. A wealth of accessories that come with this oven ensure that you have everything you need to get started cooking and baking the way you’ve always wanted to. Enjoy the use of a 13-inch non-stick pizza pan, a 12 x 12 inch enamel broil rack, and a 12 x 12 inch enamel baking pan. A one-year limited warranty guarantees the integrity of your purchase. As is the case with many kitchen appliances, it’s somewhat a matter of opinion as to which of the models out there represent the best value for your money. However, home cooks all around the world really appreciate the Breville BOV800XL and were more than pleased with the appliance’s performance.